Some will know that I am a beer lover. No, I’m not an alcoholic and I believe in being faithful and responsible in our consumption of alcoholic beverages. But, I cannot deny that I have a great love for beer. And I am in the right country as a beer lover – Belgium. I’ve written a previous article on my theology of beer. What many don’t know is that there is an interesting story behind the Irish beer Guinness. I came to know of the story via Os Guinness’s book, The Call, a remarkable book by the way. In an almost C.S. Lewis-esque style, Os Guinness shares deep and stirring thoughts about our calling, both in a primary sense to follow Jesus and in a secondary sense unique to each person. By far, I recommend the book. In The Call, Guinness shares briefly how his great-great-great grandfather, Arthur Guinness, came to the Lord. And it was Arthur Guinness who invented the ever-popular beer, Guinness. 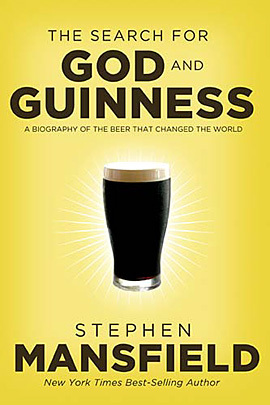 Well, recently, author Stephen Mansfield has just put out a book, The Search for God and Guinness: A Biography of the Beer that Changed the World. This book shares the more detailed story about the Guinness family and the Guinness beer. So, check out the book and if you want to know a little more about it, you can view this short video below. This entry was tagged beer, books, Guinness, video. Bookmark the permalink. Don’t forget the great Historicist expositor of prophecy (and famous preacher and missionary), Henry Grattan Guinness, grandson of Arthur Guinness. Very cool. My son has also read this book and visited the brewery just last year. BTW- I’d love a Guinness right now (unfortunately, I am here in Siberia and I’ll have to settle for Vodka). Though Belgium has great beer – 1,498 of them to be exact – I had a Guinness on tap last Friday and it tasted horrible. I was sad I wasted the money. But, of course, Guinness in Ireland is a treasure of a thing. I’m a Guinness lover too (in a very moderate way) and was thrilled to have the opportunity to visit the Guinness brewery in Dublin a number of years ago. It was the worst pint I have tasted – not a good advert. Get your Guinness in one of the local bars instead.